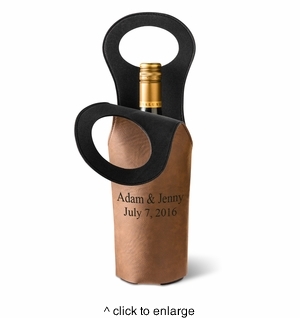 DETAILS: Give your bridesmaids (or groomsmen, or special guests) a refined gift they can cherish for years with this personalized leatherette wine tote. The custom message has a pyrographed leather look, which evokes feelings of a rustic, old country setting. MEASUREMENTS: 5 1/2" x 14 1/2"